Does Ohio Law Provide an Absolute or Qualified Privilege to the Employer? When an employer discharges an employee for purported misconduct, it is possible, perhaps even likely, that the two sides will have very different perspectives about what really went wrong. As a matter of policy, and to protect themselves from liability for defamation, many employers refuse to disclose to third parties any explanations of why former employees were discharged. 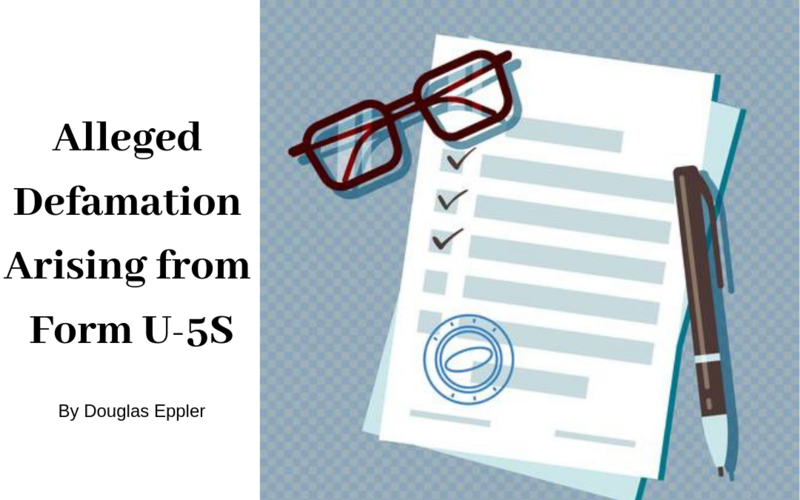 However, this option is not available to broker-dealers, investment advisers or issuers of securities, because these entities must complete and file the Form U-5, the Uniform Termination Notice for Securities Industry Registration (U-5). When individuals are discharged, or permitted to resign, the U-5 requires these regulated entities to provide an explanation. It is not surprising, the, that U-5s are common sources of defamation claims in the United States. According to one report, from the beginning of 2016 through the first quarter of 2018, there were at least 82 Financial Industry Regulatory Authority (FINRA) arbitrations in which brokers claimed that their former employees had inaccurately reported the reasons that they were dismissed. Weinberg, Neil. “What Happens When Banks Smear Their Exiting Brokers.” https://www.bloomberg.com/news/articles/2018-10-23/morgan-stanley-battle-exposes-how-firms-smear-departing-brokers. While claims of U-5 defamation often occur in FINRA arbitrations, arbitration panels (or federal courts) necessarily apply substantive state law governing defamation. To establish defamation under Ohio law, the claimant must show that (1) a false statement of fact was made; (2) the statement was defamatory; (3) the statement was published; (4) the claimant suffered injury as a proximate result of the publication; and (5) the defendant acted with the requisite degree of fault. See Am. Chem. Soc. V. Leadscope, Inc., 133 Ohio St.3d 366, 2012-Ohio-4193, ¶ 77. The elements that seem most likely to be disputed in a U-5 defamation case are the truth or falsity of the statement and the former employer’s degree of fault. In addition to the elements of the claim, another potentially significant issue is the application of the “privilege” defense for the former employer. A “privileged communication is one which, except for the occasion on which or the circumstances under which is it made, would be defamatory, and actionable.” Buck v. Village of Reminderville, 9th Dist. Summit No. 27002, 2014-Ohio-1389, ¶ 8 (citing Costanzo v. Gaul, 62 Ohio St.2d 106, 108, 403 N.E.2d 979 (1980)). The two classes of privileged communications are (1) absolutely privileged communications and (2) qualified or conditionally privileged communications, with the difference being that “complete protection is afforded by absolute privilege, whereas a qualified or conditional privilege affords protection only in the absence of ill motive or malice in fact.” Id. At ¶ 9. In other words, an absolute privilege, if it applies, provides the respondent complete immunity for a false and defamatory statement, whereas the qualified privilege allows for potential liability but requires the claimant to establish bad faith or actual malice. In the context of a defamation case, actual malice is defined “as acting with knowledge that the statements are false or acting with reckless disregard as to their truth or falsity.” Jacobs v. Frank, 60 Ohio St.3d 111, 116, 573 N.E.2d 609 (1991). Is the Privilege in a U-5 Defamation Case Absolute or Qualified? Former employers completing a U-5 almost certainly enjoy at least a qualified privilege in FINRA arbitrations applying Ohio law. A qualified privilege arises “where circumstances exist, or are reasonably believed by the defendant to exist, which cast on him the duty of making a communication to a certain other person to whom he makes such communication in the performance of such duty, or where the person is so situated that it becomes right in the interests of society that he should tell third persons certain facts, which he in good faith proceeds to do.” Jacobs, supra, 60 Ohio St.3d at 113. Ohio statutory and common law, for example, extend a qualified privilege to the similar scenario of employment references. See Ohio R.C. 4113.71(B); see also, Jahahn v. Wolf, 10th Dist. Franklin No. 12AP-624, 2013-Ohio-2660, ¶ 17 (“a qualified privilege exists as to communications of an employer concerning the discharge of a former employee to that employee’s prospective employer”). Employers that are required to complete the U-5, however, might reasonably argue that they should be afforded a higher level of protection (i.e. absolute privilege). Unlike an employer who volunteers information in response to an inquiry from a third party, completing the U-5 is required as part of a federal regulatory oversight process, designed to inform and protect the investing public. The Court of Appeals of New York, for example, held that “[t]he Form U-5’s compulsory nature and its role in the [FINRA predecessor] NASD’s quasi-judicial process, together with the protection of public interests, lead us to conclude that statements made by an employer on the form should be subject to an absolute privilege.” Rosenberg v. Metlife, Inc., 8 N.Y.3d 359, 2007 NY Slip Op 2627, 834 N.Y.S.2d 494, 866 N.E.2d 439. No court has answered definitively whether the employer’s privilege for U-5 statements is absolute or privileged under Ohio law. The United States District Court for the Southern District of Ohio confirmed an arbitration award in favor of a former branch manager of a financial services firm and refused to vacate the award on the basis of an absolute privilege for statements on a U-5. See Hilliard v. Reisen, S.D.Ohio No. 1:09-cv-535. 2010 U.S. Dist. LEXIS 29384 (Mar. 2, 2010). However, because Hilliard involved the review of an arbitration award, the District Court was limited to assessing whether the arbitrators committed a “manifest disregard of the law” that went beyond “mere error in interpretation or application of the law.” Id. At *8. The Hilliard Court cited Rosenberg and a similar case from California, but also cited cases from other jurisdictions affording U-5 statements only a qualified privilege, ultimately concluding that “[b]ecause Ohio has not held that an absolute privilege exists, and because there is a split of authority in other jurisdictions, the Court holds that the Panel did not manifestly disregard the law by not applying an absolute privilege.” Id. at *12. This did not mean that the District Court believed that the arbitration panel was correct in its conclusion that an absolute privilege did not apply to U-5 statements – just that there was no clear Ohio law on the issues. Therefore, a threshold legal issue in FINRA arbitrations applying Ohio law to U-5 defamation claims is whether the former employer’s privilege is absolute or qualified. The stakes are high, considering that an absolute privilege fully immunizes the respondent from a defamation claim and the question appears open to good faith arguments from both sides. The Supreme Court of Ohio has explained, in general terms, that the defense of privilege in defamation cases is based upon the notion that “conduct which otherwise would be actionable is to escape liability because the defendant is acting in furtherance of some interest of social importance, which is entitled to protection even at the expense of uncompensated harm to the plaintiff’s reputation.” Surace v. Wuliger, 25 Ohio St.3d 229, 231, 495 N.E.2d 939 (1986). In Surace, the Supreme Court held that “[a]s a matter of public policy, under the doctrine of absolute privilege in a judicial proceeding, a claim alleging that a defamatory statement was made in a written pleading does not state a cause of action where the allegedly defamatory statement bears some reasonable relation to the judicial proceeding in which it appears.” Id. at Syllabus. Ohio courts have extended this holding to statements made in quasi-judicial proceedings as well. Lemay v. Univ. of Toledo Med. Ctr., 10th Dist. Franklin No. 17AP-640, 2018-Ohio-1311 at ¶ ¶ 37-40. With these principles in mind, Rosenberg, the New York case cited above, suggests a possible argument for an absolute privilege under Ohio law. In Rosenberg, the New York Court of Appeals reasoned, in part, that the “U-5 can be viewed as a preliminary or first step” in a “quasi-judicial process,” because upon “receipt of the Form U-5, the NASD [National Association of Securities Dealers] routinely investigates terminations for cause to determine whether the representative violated any securities rules.” Rosenberg, supra, 8 N.Y.3d at 367. A respondent in Ohio might similarly argue that affording an absolute privilege to U-5 statements is a logical extension of existing Ohio law related to quasi-judicial proceedings, and that there is a strong policy reason to encourage full responses on U-5s. On the other hand, statements on U-5s do not fall specifically within the limited category of statements that explicitly enjoy complete immunity under current Ohio case law. Arbitration panels and trial courts may feel that it is not within their authority to expand the scope of the absolute privilege, absent a specific holding of the Supreme Court of Ohio. Further, as a policy matter, immunizing former employers entirely from liability for U-5 defamation, through an absolute privilege, is arguably unnecessary because the qualified privilege already provides protection for false statements arising from mere innocent mistakes. An absolute privilege could also exacerbate what some describe as an existing problem that “[m]arking up a U-5 is the latest weapon” of firms to “wrongly undercut the brokers – often in an effort to hobble their chances of taking business with them on the way out the door.” Weinberg, supra. For now, these and other arguments regarding the privilege defense are fair game before arbitration panels and trial courts applying Ohio law to claims of U-5 defamation. *This article was originally published in the March 2019 issue of the Cleveland Metropolitan Bar Journal. It was republished here by permission of the CMBA.